Winston Jarrett was born in 1944 in Lime Tree Gardens in the parish of Saint Ann and moved at age five to the notorious Jonestown section of Kingston’s notorious western slum, Trenchtown. In 1965, Alton Ellis recruited Winston Jarrett and Eggar Gordon (Baby Gee) to form a new harmony group, Alton & The Flames. After several months of intense practice, they auditioned at Duke Reid’s studio and won the enthusiastic endorsement of Leroy ‘Cuttings’ Cole, Reid’s number one selector. They were soon recording a series of classic rock steady anthems, and went on to score an extraordinary number of chart hits. After recording many tunes for Duke Reid, the group was lured away by Sir Coxsone who produced more hits. In 1969, Alton moved to England and Winston reformed the group as The Righteous Flames with harmony from Baby Gee. Since then, Winston has recorded hundreds of titles under his own name, as well as a number of pseudonyms. 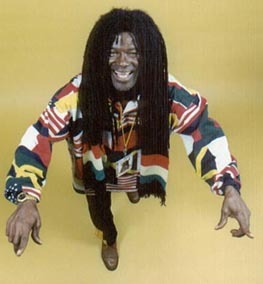 In addition, he has backed up vocalists like Ken Boothe, Marcia Griffiths and Winston Francis. He also worked with Enid Cumberland and Larry Marshall as the Freedom Singers. Young Tree Records is proud to present Survival is the Game the first ever gathering of Winston Jarrett’s music. This two-disk collection spans his entire career and beautifully illustrates the progression of reggae music. Winston Jarrett’s music is still just as vital today and he remains one of reggae’s true pioneers. The choice was either sports or music at an early age for Trinidad-born Wadi Gad. Music won out and over the past thirty years, the legendary drummer, singer, songwriter, producer and instructor continues to show the world that Wadi made the right choice all those years ago. Experience teaches wisdom, and as a very experienced, strong and conscious singer, Wadi Gad delivers his words of wisdom with an original style and sound. Earning his credentials and position in reggae music over three decades, the internationally known reggae artist Wadi has performed with is a literal “who’s who” in the reggae industry for the past three decades – The I-Threes, Abyssinians, Big Youth, The Itals, Boom Shaka, Ras Michael, U-Roy, Eek-A-Mouse, John Holt, Terrance Trent D’Arby, Mighty Diamonds, Queen Omega, Junior Marvin, Sugar Minott, Yami Bolo, Don Carlos, Alton Ellis, Ken Boothe, Johnny Osbourne, Culture, Sister Carol, Joe Higgs, Horace Andy…and the list continues to grow. Wadi is a foundational messenger of peace and righteousness. His message couldn’t come at a more crucial and critical time than the present. Wadi speaks out against senseless crime and violence in his hit song “Bad Boys.” A singer who maintains a high standard of lyrical content, Wadi chooses to offer positive solutions to society’s dangers, rather than merely accentuating the negative. The song “Never Give Up” will attest and reflect the moral standards and integrity of a royal order. Wadi is also involved with a number of new releases including the album Nightshade Meets Scientist featuring Wadi Gad which has 15 solid dub tracks mixed by the great engineer ‘Scientist’ (Hopeton Brown), Dread Flintstone presents Rockers for the Most High which includes, amongst others, Gregory Issac as well as Zion High Release featuring Ras Attitude and Batch in which Wadi was responsible for creating the riddims and performing the percussion on eight tracks.